In this ever-interesting North London project space, artists Joey Holder, Josephine Callaghan and Klassixx take the terrain of Romantic poetry as a jump of point to explore 'thrall'dom', and present a mesmerically enticing approach to art making chasing distant horizons and celebrating the objects of the imagination. In times of Twitter revolutions and camera phone footage on Newsnight, this compendium celebrates the revolutionary photographers from the Hungarian uprising in 1956 through to the events of the Arab Spring. Judging by the discussions taking place at openings, Rihanna's SNL 'Diamonds' performance is still ruffling the feathers of the Internet artists the world over as she takes the aesthetic, blows it out of the water and makes it (more) mainstream. Cries of 'ah no, i'm boycotting Post-Internet art it's so over' to be heard chiming all over East London. In the vibrant, assertive work of the young French artist, assemblages of almost-narrative fragments appear across video environments nestled into sets and various materials. His approach to installation breaks down information hierarchies and engenders layered meaning, whilst also being visually and spatially seductive. His show at Palais de Tokyo runs until February 2nd (17/10/2012 - 11/02/2013). The art work lends its name to the RCA 175 exhibition which opened last week. Celebrating 175 years of the eminent college, the campus adjacent to London's Royal Albert Hall has accumuated works by its more prestigious alumni, Emin among them. In the work, the viewer climbs to a shed-like structure and peers through a hole in order to observe the artists father as filmed on a Super 8 camera. 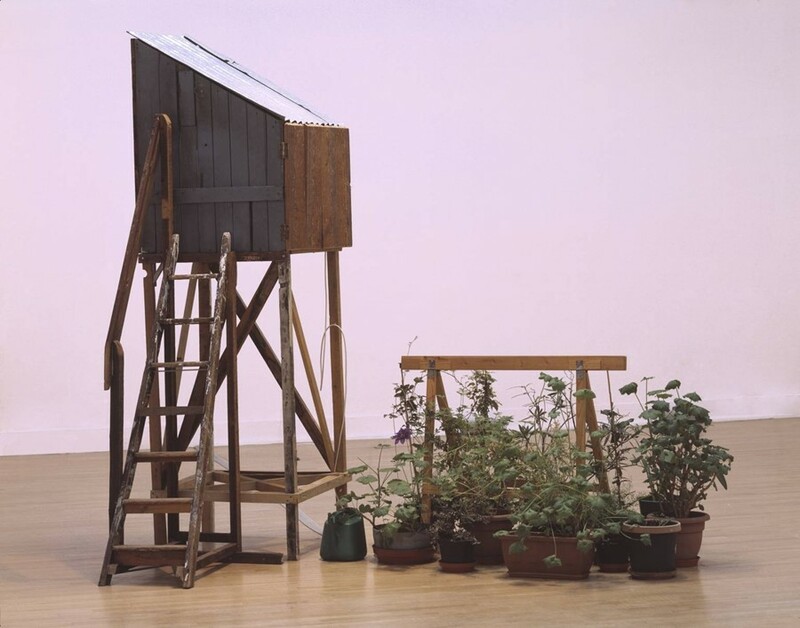 Beneath are plants and a trestle constructed by the artists father placed next to a full watering can.